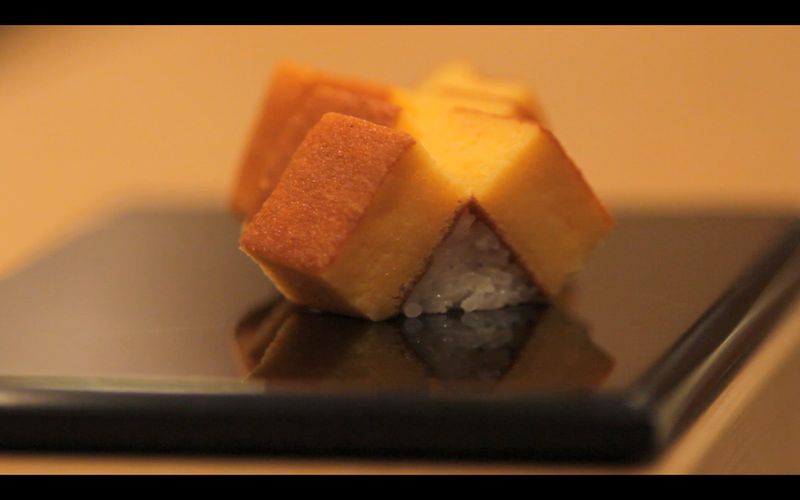 Tamago sponge cake is so moist, sweet and tasty. And do you know what? It’s made without any fat! Tamogo means egg in Japanese. You use a generous amount of egg and that’s what makes this cake so flavoursome! 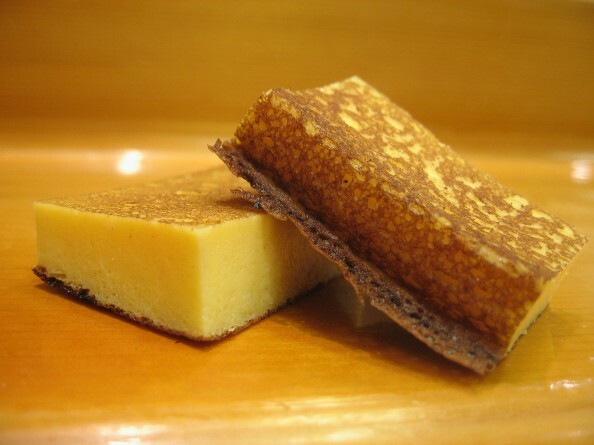 There are a number of famous Tamago cake makers around in Japan. But it’s quite simple to make so why not try it yourself! The only thing is that the egg needs to be bean a lot so I suggest you get a hand mixer: Or you can build the muscle by doing this with a balloon whisker. This is one of my favourites from my auntie’s kitchen. It’s such a treat to visit her not just because I can get a huge serving of this cake, but also she makes fabulous cheese cake with this sponge as the base, instead of crushed biscuits. So good. .
100g Strong Flour, Sifted. Divide this into roughly 3 portions. 1. Prepare the cake tin with the baking parchment at the bottom and inside the wall. Sprinkle some Demerara sugar evenly: this adds texture and flavour to the finished cake. Set the oven for 180 degree c.
2. Prepare a pan with some water at the bottom. Bring it to the simmer. 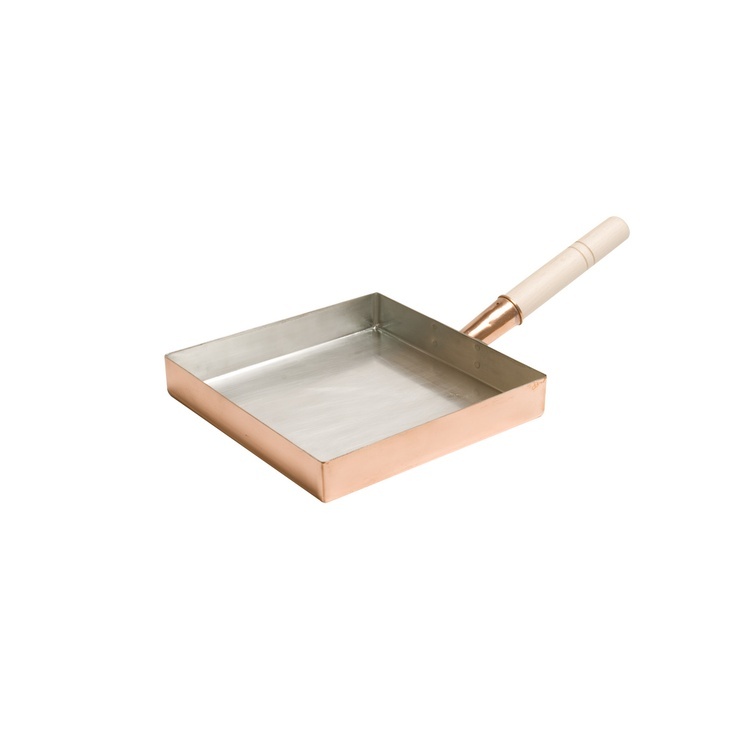 The pan needs to be large/small enough for a metal mixing bowl for beating the eggs to sit without touching the water. 3. In the metal mixing bowl, put all the eggs and sugar. Let the bowl sit on the pan so that the steam from the barely simmering water will keep the egg mixture warm. 4. Beat the eggs and sugar together at the high speed for 6 minutes. The volume should increased a lot, as much as 4 times. 5. Mix the hot water and honey together and pour this into the beaten egg/sugar mixture. Keep on beating at a moderate speed for a minute. 6. Sift the 1st portion of strong flour into the egg mixture. Let it mixed in using the mixer at a moderate speed, probably just for 10 seconds or so. Do not over mix! Repeat this for the 2nd portion. When the 3rd, last, portion of strong flour is added, beat in using the slower speed to make sure that the flour is well combined in the mixture, for a minute or so. 7. Pour the mixture into the prepared tin. Tap the tin lightly, and/or use a skewer to drag around in the mixture, to get rid of large air bubbles. 8. Bake at 180 Degree C for 5 to 10 minutes to brown the surface. During this time, prepare a strip of foil large enough to cover the entire tin. When the top of the cake is browned enough, cover the tin with the prepared foil, reduce the temperature to 170 degree C and bake for another 55 minutes. When the cake is fully baked, tap the tin lightly and take the cake out of it. Cover the entire top of the cake with cling film. Put a baking tray over the cling filmed cake top, then reverse the whole thing, the cake with the tray. Now the top of the cake is at the bottom. The weight of the cake lets the domed top, now at the bottom, to be flattened. Try your best to do this flipping procedure quick before the surface of the cake starts to unevenly sink. 10. Whilst it is hot, the cake must be completely covered and sealed in a plastic bag or long stretches of cling film. This is the key for the moist texture. Let the cake to get steamed up and cooled down to mature for 12 hours. Then it’s ready to be cut. 11. Extra couple of days of maturing would just make the cake so perfect. Do change the covering half way through as its inside should have accumulated quite a bit of the condensation by now. Keep the cake at the room temperature. 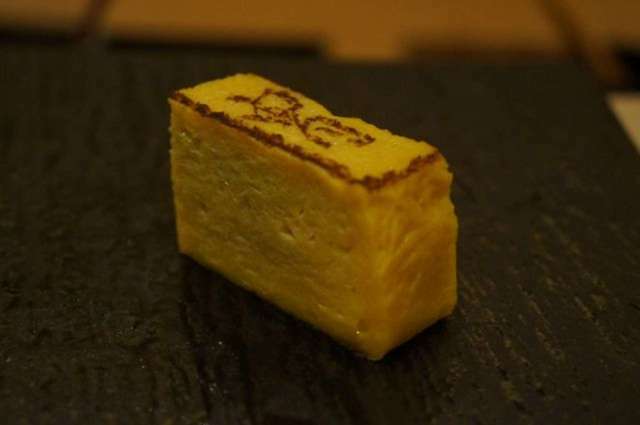 Tamago cake is usually branded with the maker’s logo. You can do the same with heated metal of various shapes! Use a very sharp long knife. Dub the blade with hot water before cutting. Clean the knife and repeat the exercise for the professional look. Up to 7 days at a cool temperature from the time baking finished. Suitable for freezing. I hope you enjoyed this and do not hesitate to contact us if you have any queries! any parasites) shellfish tofu or eggs. If you want to see more sushi recipes check-out my blog: http://www.makesushieasy.com ! Thanks! Normally I don’t read post on blogs, however I wish to say that this write-up very forced me to take a look at and do it! Your writing style has been surprised me. Thanks, very nice article. Reblogged this on An anonymous Montrealer's Michelin Star dinners.